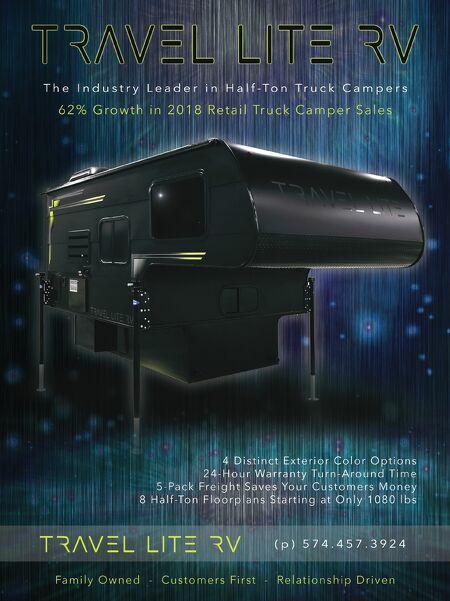 40 • RV PRO • November 2018 rv-pro.com O P E N H O U S E C O V E R A G E Travel Lite Evoke In recent years, this manufacturer that once dealt exclusively in truck campers has been building an increasing dealer following by playing in the small, lightweight travel trailer segment. President Dustin Johns seemed to have hit on an itch that was dying to be scratched with the colorful, aerodynamic Falcon and F-Lite a year ago. A small toy hauler was even among the units introduced. 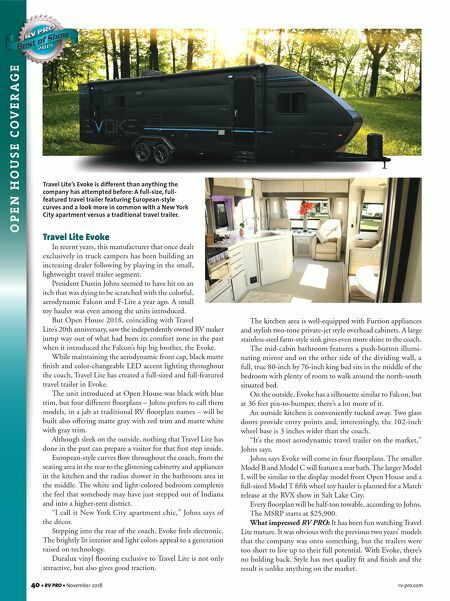 But Open House 2018, coinciding with Travel Lite's 20th anniversary, saw the independently owned RV maker jump way out of what had been its comfort zone in the past when it introduced the Falcon's hip big brother, the Evoke. While maintaining the aerodynamic front cap, black matte finish and color-changeable LED accent lighting throughout the coach, Travel Lite has created a full-sized and full-featured travel trailer in Evoke. The unit introduced at Open House was black with blue trim, but four different floorplans – Johns prefers to call them models, in a jab at traditional RV floorplan names – will be built also offering matte gray with red trim and matte white with gray trim. Although sleek on the outside, nothing that Travel Lite has done in the past can prepare a visitor for that first step inside. European-style curves flow throughout the coach, from the seating area in the rear to the glistening cabinetry and appliances in the kitchen and the radius shower in the bathroom area in the middle. The white and light-colored bedroom completes the feel that somebody may have just stepped out of Indiana and into a higher-rent district. "I call it New York City apartment chic," Johns says of the décor. Stepping into the rear of the coach, Evoke feels electronic. The brightly lit interior and light colors appeal to a generation raised on technology. Duralux vinyl flooring exclusive to Travel Lite is not only attractive, but also gives good traction. The kitchen area is well-equipped with Furrion appliances and stylish two-tone private-jet style overhead cabinets. A large stainless-steel farm-style sink gives even more shine to the coach. The mid-cabin bathroom features a push-button illumi- nating mirror and on the other side of the dividing wall, a full, true 80-inch by 76-inch king bed sits in the middle of the bedroom with plenty of room to walk around the north-south situated bed. On the outside, Evoke has a silhouette similar to Falcon, but at 36 feet pin-to-bumper, there's a lot more of it. An outside kitchen is conveniently tucked away. Two glass doors provide entry points and, interestingly, the 102-inch wheel base is 3 inches wider than the coach. "It's the most aerodynamic travel trailer on the market," Johns says. Johns says Evoke will come in four floorplans. The smaller Model B and Model C will feature a rear bath. The larger Model L will be similar to the display model from Open House and a full-sized Model T fifth wheel toy hauler is planned for a March release at the RVX show in Salt Lake City. Every floorplan will be half-ton towable, according to Johns. The MSRP starts at $25,900. What impressed RV PRO: It has been fun watching Travel Lite mature. It was obvious with the previous two years' models that the company was onto something, but the trailers were too short to live up to their full potential. With Evoke, there's no holding back. Style has met quality fit and finish and the result is unlike anything on the market. Travel Lite's Evoke is different than anything the company has attempted before: A full-size, full- featured travel trailer featuring European-style curves and a look more in common with a New York City apartment versus a traditional travel trailer.